Trailer Review: An Education is an elegant coming-of-age drama based on the memoir of Lynn Barber. At the heart of the film is Jenny, a clever but impressionable suburban teen, whose older beau and life guide easily lures her away from the ennui of suburbia into a thrilling world full of adventure and glamour. 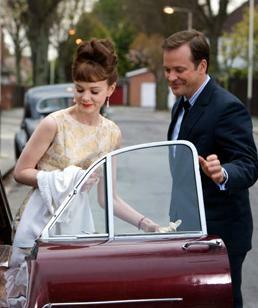 The film stars Carey Mulligan along with Peter Sarsgaard, Alfred Molina, and Rosamund Pike. Set in London in 1961, An Education explores lessons of youth versus maturity. Jenny (Mulligan) is bright beyond her years and on her way to study at Oxford. Yet, as Jenny spends much of her time lost in reveries about living in Paris, she can’t help but wonder if perhaps she could gain more from life outside of university. Her opportunity to explore this vacillation comes along during a chance encounter with a man named David (Sarsgaard). Even though he is twice her age, David is a smooth operator, the kind of guy who could talk a dog off a meat wagon, so Jenny, as well as her parents, quickly falls under his spell of urbane charms. David whisks Jenny away into an exhilarating world of cocktails, jazz clubs, and Parisian weekend getaways. Jenny positively thrives in this new environment, learning many things about life that she could never have learned in a classroom. This exceptional education does not come without a price, however, as the threads of David’s sensational world begin to unravel. As An Education is a coming-of-age piece, the primary aim of the trailer is to foster an understanding of the protagonist so as to set up her growth arc. In the trailer’s opening scenes, Jenny’s character is established as precocious but with a tender, rebellious streak. When the silver-tongued David enters the picture and transports Jenny into a scintillating new dimension, she is left starry-eyed and wanting more. Wearing her plaid, school girl dress, Jenny at first appears to be very naïve and vulnerable in her new surroundings. At the same time, however, the trailer does an excellent job of portraying Jenny’s innate sophistication so she does not entirely seem like a fish out of water. Ripening in measured steps from fledgling vulnerability to ever optimistic world weariness, relative newcomer Carey Mulligan is outstanding in her portrayal of Jenny, a performance that garnered her an Oscar nomination. The trailer is very adept at choosing clips and dialogue excerpts that effectively showcase Jenny, and concurrently Mulligan’s powerhouse talent, at each of the key stages of her maturation process, creating a simultaneous vibe of ecstasy and heartbreak. Check out the trailer for An Education below. What do you think?